Calum Macdonald makes clear in his liner-note that Weiner was very much part of a Hungarian quadrumvirate alongside Bartok, Kodaly and Dohnanyi. His reputation however travelled less easily than those of his confreres. His musical production of some fifty works tailed off after the mid-1920s as his teaching duties took a hold. Among some fifty works there are three string quartets, a string trio, some violin concertos, a concertino for piano and orchestra and a romance for cello, harp and strings. His numerous pupils included Anda, Dorati, Katsaris, Kentner, Rózsa, Solti, Starker, Varga, Vasary and Vegh. The 1911 First Sonata is constantly in romantic song caught between Brahms and early Richard Strauss. The last movement is exuberant and trips over its own shoelaces in its zest and attack. The four movement Second Sonata is from 1918 written just after his highly successful incidental music for Csongor es Tunde. The music is more tangily Hungarian but still rooted deeply in Brahmsian romanticism. In its orchestral guise this Sonata is the Second Violin Concerto of 1957. This is passionate music in the same sense as the Korngold chamber music and the Delius violin sonatas. The finale brings Weiner as close as he ever got to Kodály. At other moments we think of the heady Delius and at others still of the contemporaneous Dunhill Second Sonata. The Pereg Recruiting Dance mixes military determination with cafe swooning. The Lakodalmos similarly picks up on ikonic Hungarian zigeuner styles. The Three Hungarian Folk Dances and the Twenty Easy Little Pieces are in similarly pointed vein. 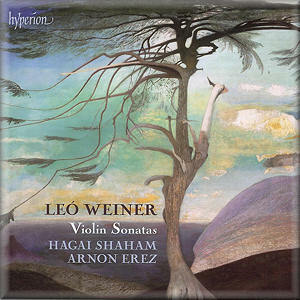 Let's hear more Weiner especially the violin concertos, the Csongor es Tunder suites and the three string quartets. Weiner seems always to have been more Dohnanyi than Kodály. Certainly his style was never anywhere near Bartók. His was the Hungarian gypsy style carried over from the nineteenth century into the twentieth.